Bodhi’s minimalism philosophy means that few applications come pre-installed on your system. Which means you are free to populate it with whatever software packages suit you best. This article describes the various ways you can do this. The AppCenter features a great selection of excellent software, all of which will run without problems on Bodhi Linux. Either search for the software by name in the Search box, or select from the listed categories to see what’s on offer. The AppCenter can only feature a tiny fraction of the thousands of programs available in the software repositories, and to access the rest you need Synaptic. You can install Synaptic from the AppCenter. When you run Synaptic and its window opens, you will see that there is a toolbar at the top with a Quick Filter box and alongside it a Search icon. You can use either of these to search for packages. ‘Quick Filter’ is easiest and fast, and you can normally use this. ‘Search’ will find all packages which include your search term in their accompanying description. When you find the package you want, click the box to its left, select ‘Mark for Installation’, then click Apply (in the toolbar). If you know the name of the software, you can quickly add it from the terminal. The command is: sudo apt-get update && sudo apt-get install <program name>. You can configure your web browser to open the .deb package in gDebi rather than save it. In the case of Firefox, when you try to download the package a dialog box will open, shown below. 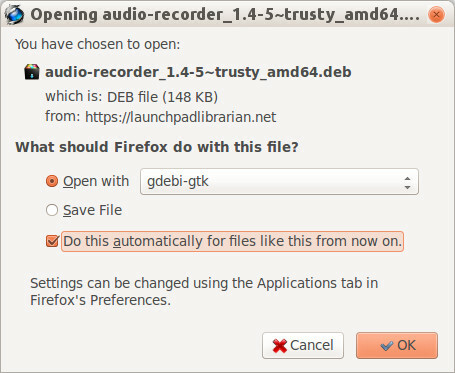 Click on the small arrow at the right of the ‘Open with’ box, choose ‘Other…’, then navigate to the /usr/bin folder and select gdebi-gtk. These are non-official third-party repositories, often software developers’ repositories, which may contain more up-to-date versions of software than is available in the official repository. Bodhi Linux does not recommend that you use such unofficial repositories, and you do so at your own risk: some files downloaded from them may conflict with what’s already on your system. If, despite the risk, you do wish to make use of a PPA, you must first download software-properties-common from Synaptic. If a package you want is not available in the official repository or as a .deb file, or if it is out-of-date, your best option is to put in a request for it to be added/updated. You can do this at the Software Request Thread in the Feedback section of the Bodhi Linux Forum. Click here to access the Bodhi Linux AppCenter!